The reason why I think I was drawn to this piece is because of the way Brainard uses candid language to depict detail and observations. And, how these observations are not predictable and for me, at least, ask me to rethink what I notice both when my eyes are open and closed. We began this class session by writing about the following: How do you pay attention to something? Or, what does it mean (for you) to pay attention? We then distributed a stack of ten post-it notes to each person, and wrote one specific detail or image on each--these could be a series of descriptive words or a sentence demonstrating an observation or scene that resonated for the writer. The notes were redistributed so everyone had 10 new post-its. I hand out copies of Brainard’s “Ten Imaginary Still Lifes.” One volunteer reads the entire piece. We then read the piece out loud sentence by sentence; every voice in the room participates. We then write about the following: What is a still life? What is an imaginary still life? When sharing our writing, most students linked “still life” to art—mentioning that a still life is realistic and detailed—a form of visual description. Someone in the room mentioned that each "Still Life" begins with "I close my eyes." So, as a class, we then decided to close our eyes and write "still lifes." We then decided to, as a class, write “32 Imaginary Still Lifes” and the prompt was to begin each piece with “I close my eyes” and to only work with the language from the writing we did with our eyes closed + the language from the post-it notes. We read these all out loud and then did a piece of process writing—why write an “imaginary still life”? Why is it important that we include “imaginary”? Berthoff, Ann E. Forming, Thinking, Writing. Portsmouth, NH: Boynton/Cook, 1988. Print. Brainard, Joe. 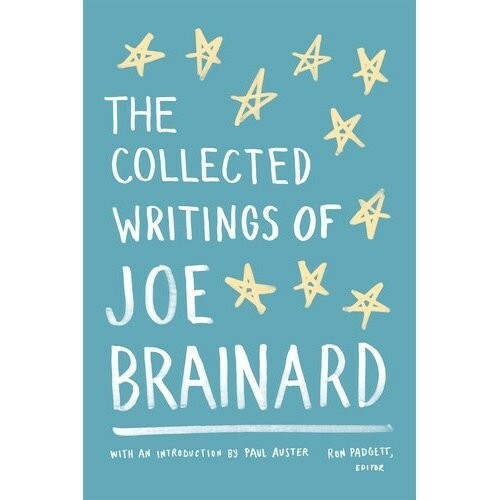 The Collected Writings of Joe Brainard. Ed. Ron Padgett. [New York, N.Y.]: Library of America, 2012. Print.